What do you do when life hands you leftover baked potatoes? You make baked potato soup, of course. This simple potato soup recipe is an easy family favorite. When we were living with our friends, we made baked potatoes to go with our big Sunday dinner. 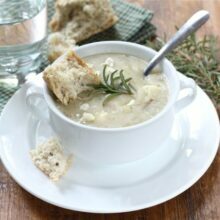 We ended up having too many, so the next day I made this homemade potato soup recipe for everyone to enjoy. If you have leftover baked potatoes, you HAVE to make this soup! It will remind you of a loaded baked potato but in soup form! It is delicious and perfect comfort food! I used a recipe from Cooking Light. 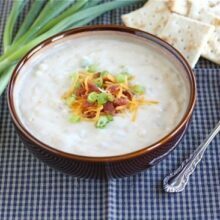 It was very easy to follow and a little lighter than most loaded potato soup recipes. This recipe uses milk instead of heavy cream and reduced fat sour cream instead of full fat sour cream. You can also use plain Greek yogurt for the sour cream, if you wish. If you don’t have leftover baked potatoes, you can bake potatoes in the oven just to make this soup. Making baked potatoes is easy and SO worth it for this soup! We use shredded cheddar cheese. You can use sharp or medium cheddar cheese. You could even add in some white cheddar if you wish! This potato soup recipe is meant to be loaded with ALL of the toppings. Garnish the soup with extra cheese, green onions, sour cream, and chopped bacon. You can also top your soup bowl with crackers or dip crusty bread into your bowl. Loaded Baked Potato Soup is the best! Don’t go skimpy on the toppings. The soup is thick, creamy, and comforting. It is the perfect meal for a cold day or when you are in the mood for some major comfort food! This easy and comforting soup is a family favorite. It is great for lunch or dinner. Preheat oven to 400 degrees F. Pierce potatoes with a fork; bake for one hour or until potatoes are tender. Let the potatoes cool. Peel potatoes and coarsely mash them in a small bowl. Set aside. In a large soup pot, add the flour. Gradually whisk in the milk, whisk until smooth. Cook over medium heat until thick, about 8 minutes. Add mashed potatoes, cheese, salt, and pepper. Stir until the cheese melts. Add in sour cream and green onions. Cook over low heat until thoroughly heated, do not boil the soup. Ladle soup into bowls and garnish with toppings. Serve warm. YUM! I haven’t made potato soup in quite some time. Delicious. The thought of sour cream mixed in makes my tummy grumble. That is what I call comfort soup. Hmmm. Yes, I agree with Lori. Comfort food! Your soup looks perfect for today’s weather. baked potato soup! what could be bad. my kids like me to double stuff my baked potatoes, I am sure they would love this as an alternative! Oh I love baked potato soup! It is actually one of my favorite soups. So delicious! the cold weather lately has been making me crave soup. this looks delicious! i’ll be making this for dinner this week for sure! This looks wonderful, Maria. 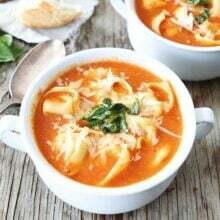 It’s super chilly here in Southern California now, so it’s time for me to start stock-piling delicious soup recipes… I will definitely be giving this one a try soon – it looks delicious! Potatoes and soup were meant for each other. Great soup recipe! This soup looks so warm and comforting! What a timely recipe, Maria! These cool fall days just scream for warm comforting soups like this. 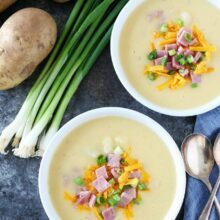 Potato soup is one of favorites and I’ve never had a really good recipe for making it myself. Now I do! 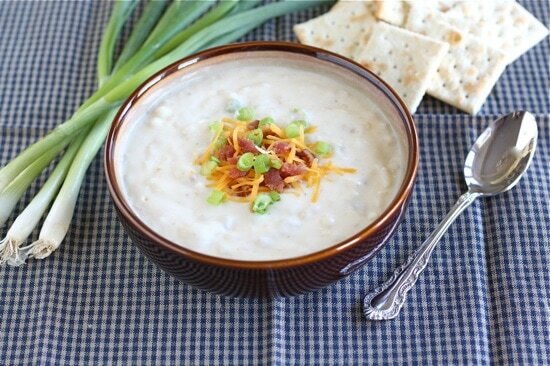 We love Baked Potato Soup and it’s fast becoming soup weather here in Northern IL! Love the idea of serving it with the Drop Biscuits! This looks delicious, especially for this rainy weather we’ve been having here in CA! Bring on the soup! Yum! This sounds perfect right now. And I think I’ll take Josh’s recommendation to make the biscuits with them. my tastebuds are exploding right now, this sounds perfect for the rainy day we’re having here! You must have read my mind! This is one of my favorite soups! We think too much alike, just put this on my menu this month 🙂 Love your recipe and photo! This looks so tasty and comforting esp with the bacon! How funny that we both posted baked potato soups today! Yours look delicious and I am definately going to try the biscuits you mentioned! This looks delicious – I just had to tell you that every recipe you post I star to come back & try later! It’s been cold and rainy here all week in NY – this soup would be PERFECT dinner given the weather! This is pure comfort in a bowl right here. It doesn’t get better than this. Maria, I literally JUST made this like an hour ago. Don’t you love CL mag? It’s a great soup, huh? I bet it is perfect with those drop biscuits! See ya tomorrow! I have a feeling Josh recommends bacon biscuits to be made with everything! This soup does look scrumptious though! Awesome! I will be making this soon. My hubby brought a 50 lb bag of potatoes home yesterday. I have no clue what I’m going to do with all of them. Most likely give a bunch away! Potato Soup is my weakness! Ah, baked potato soup! This was a go-to recipe for my family growing up – such perfect comfort food. Only we used a lot of butter, and no sour cream. I think yours is a smidge healthier! Sometimes I would also make some bacon first for a garnish, and then start my soup with a bit of the bacon grease. Sounds delicious. I made a recipe once that didn’t turn out as pretty as this one. I think i will try this one out. This sounds very comforting for fall and love the toppings on there as well. It would be good with some spice added in too for those cold nights! Wow, that sounds fantastic! I love soups that can be garnished to each person’s taste. Wow this soup looks lovely – a great idea and I love the topping! To me this would be comfort in a bowl and enjoyed in every spoonful. Delicious- it’s actually been chilly here lately. Ready for soup! you said “when” we lived with our friends… does that mean the remodel is complete?? Carrie-we are home, but the remodel is not complete yet. We are close though! It’s nice to be home again. Potato soup is one of my favorites. I can’t wait to try your recipe for baked potato soup! Love the lighter version recipe. I love potato soup. This looks great, saving recipe! I could probably eat soup every day for lunch…and I definitely wouldn’t mind having some of this for tomorrow’s lunch! It looks so yummy! That soup looks lovely! 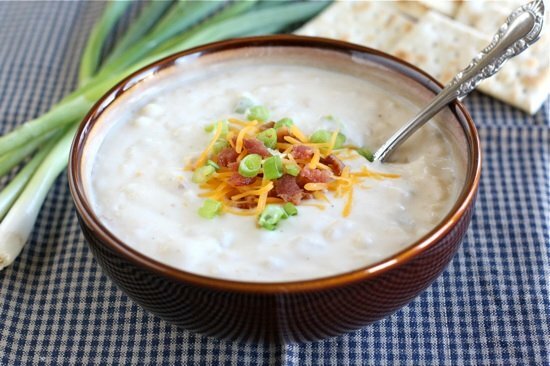 I have been craving some baked potato soup lately… I think I even have all of the ingredients on hand! Just made this soup tonight for my husband. It got rave reviews though it did need a bit more salt and pepper in the end. I omitted green onions as hubby doesn’t like them and used regular fat sour cream but other than that stuck to the recipe. This will have a permanent spot in my recipe book. Thanks! Mmm baked potato soup is one of my favorites. I can never say no to creamy soups and this cool fall weather definitely has me craving soup. I’m going to try this recipe. I love baked potato soup! I love baked potato soup! I am SO trying this ASAP. Thanks for the awesome posts! I’ve been meaning to make this recipe for the past few winters, but have never gotten to it. Thanks for the reminder, yours looks awesome! I cant wait to try this just perfect for this time of year and love potato anything! I made this tonight and it was great! Tastes like twice-baked potatoes! I used 1 percent milk and found that worked just fine. I also used gruyer cheese instead of cheddar. Definitely a keeper! Thanks for posting! Oh, and I also threw the skins in, chopped up, since I love potato skins! Made this last night for my family, I had to double the recipe as I have a large family. I found it pretty bland, I would definitely recommend more salt and pepper. I added some seasoning salt as well which helped. Excellent recipe! I added some diced ham that I crisped up. This is my new potato soup recipe! Thanks. I just got done making this soup and it’s probably the best baked potato soup I’ve ever had! I’m getting braces tomorrow and thought soup would be nice to have around. I love that it’s not too heavy – just fantastic! Thanks so much ;)! Just made this. The house smells AMAZING and can’t wait till hubby gets home from work so we can dig in and eat it all up. You are welcome! Enjoy the soup! I made this soup for lunch today. It’s positively divine! I’m so happy eating it. I will be featuring it on my blog next month. Thank you so much for my new favorite soup recipe. It is one of our favorites too! Glad you liked the soup! Thanks for this baked potato soup recipe. Such perfect fall comfort food! Who doesn’t love a good baked potato soup? And those biscuits with it? Heavenly! This is SERIOUSLY, no kidding, THE BEST soup on the face of this earth!!! !